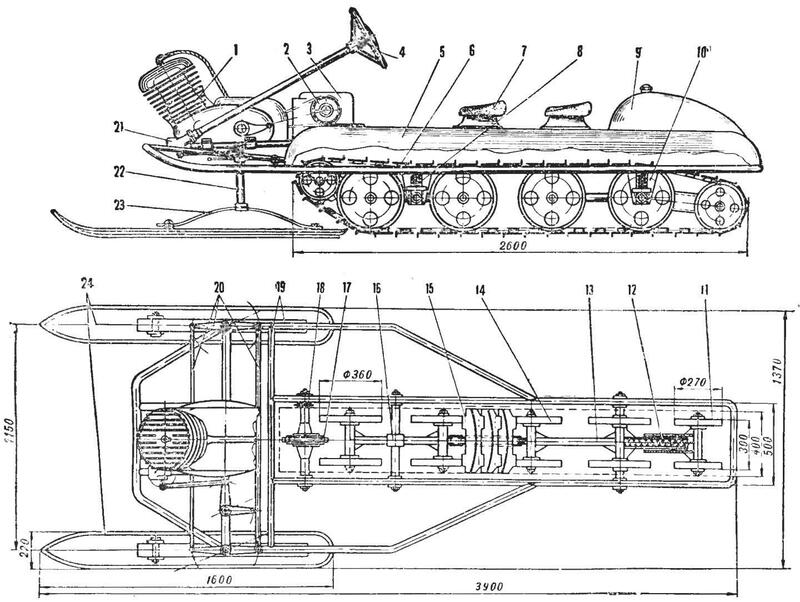 Snowmobile, manufactured by V. I. Shadrin is not motonarty. 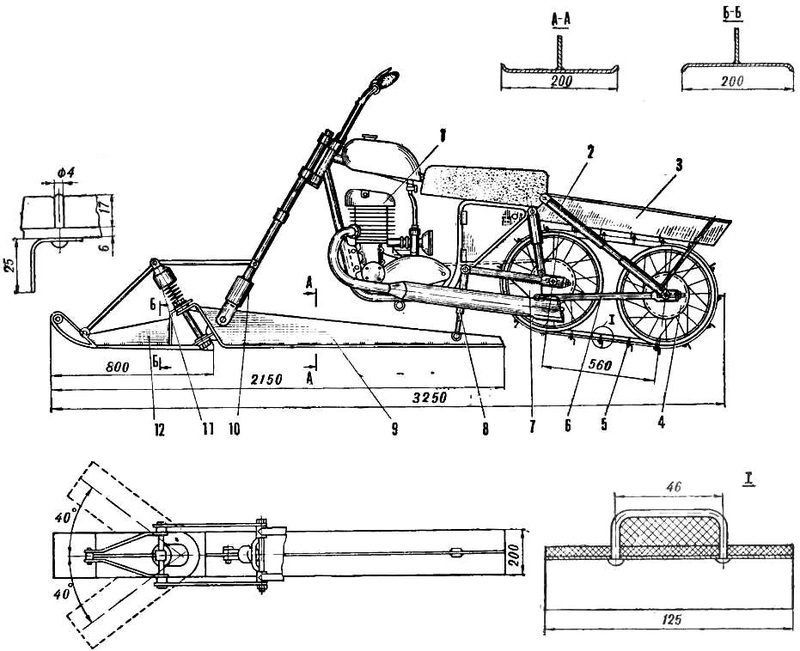 The author of the design set out to make winter “Rover” of the Izhevsk motorcycle plant with minimal alteration to improve performance on snow-covered path. 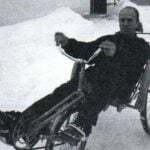 At the front of the snowmobile, called “Impromptu”, is the steering wheel mounted articulated ski. Her guiding part is connected with a turning fork of a motorcycle and is management. The rear part of the ski has an inclined axis for connection with the front swivel part. It is attached to the plug through the sleeve, through the shock to the frame of the motorcycle. In the longitudinal direction of this part of the ski is stationary. It is also the carrier: it transferred the weight of the car and the driver. Due to the depreciation of the ski provides smooth movement on rough roads. Interestingly, the removed front wheel is not left idle: it is installed behind the rear wheel and attached to the frame of the bike pendulum stretching and a core-absorber. On both wheels worn track. Tension, in addition to the rod of the shock absorber is provided by a tensioning device mounted at the ends of the pendulum levers. Track passes directly at the rim. The inner part of the tread wheels of the car “GAZ-51”. Outdoor sing — rubber tape with a thickness of 5÷6 mm and a width of 125 mm. To ensure a good grip with the snow and prevent slipping of the tape on its outer side mounted lugs, made of sheet duralumin or stainless steel. The size of the lug area is 25X25 mm. Slightly inclined arrangement of the wheels (see drawing) is not accidental. This provides a higher specific pressure on the rear end of the track, thereby improving its grip with the ground. Top tracks closed box-shaped casing. It protects the driver from being captured by the caterpillar of the snow. In addition, the casing is attached to the trunk. Innokenty Aleksandrovich Karelin does motonarty. Before reliable, it is a workable machine, haven’t tried one option. One of the major challenges which mainly had to decide was the design of the track. The fact that in the harsh winter conditions of Yakutia, when the air temperature falls below 50°, the snow becomes like an abrasive powder. Ski it non-slip grip and rubber band, usually used by the fans for the caterpillars becomes brittle. After 3-8 km of the way it breaks down, crumble and become unusable. I. Karelin, performing a series of experiments, settled on a metal track. Fig. 1. Motonarty “Yakutia” (top view). Fig. 3. Power transmission with self-made transmission. The basis for this film was the roller-coaster circuit, which engages the drive sprocket caterpillars. On the chain links, through one notched welded steel plate constituting the supporting part of the tape. The size of each — 400 mm — specifies the width of the tape. From the chain to the plates welded to the guide ribs to enable the tape to go with rollers. To increase the strength between the chain link and the guide rollers are additionally welded ribs. The outer side plates welded lugs, consisting of a main ridge, edge strength and angle supports. Plate strips are connected only by a chain with step 67 mm. its Links are connected by pins Ø12 mm. this design of the tape provides sufficient flexibility and allows you to easily overcome obstacles such as felled trunks in the forest trees. Unusually made and the tension of the tape. The tensioning rollers are connected with the axis carriage via a spring-loaded shock absorber which ensures its tension. 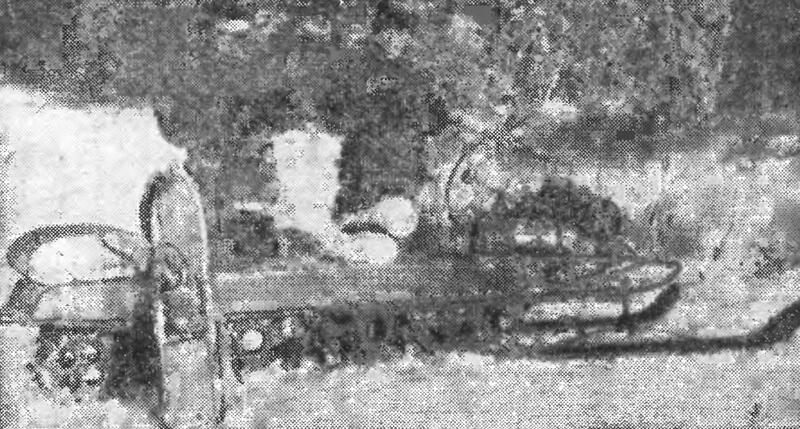 Eight rollers of the tape Ø360 mm planted on the swaying carriage. Axis fixed in the rigid brackets of the frame, textolite in the sliders that move in the vertical slots and the amortized coil springs. The axis of rollers equipped with ball bearings reference No. 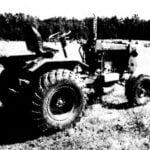 204 and the axis of the tensioning rollers — No. 205. Case motoart is a flat frame, welded from steel tubes Ø 38 mm. In front of the pipe bent like a ski sock and the bottom, to caterpillar, covered with sheet duralumin. 1 — engine, 2 — sprocket drive gears from the engine, 3 — gearbox, 4 — steering wheel 5 — bonnet 6 — the caterpillar 7 — seat, 8 — side spring suspension rear rollers, 9 — tank, 10 — side spring suspension rear rollers, 11 — stretch rollers, 12 is a spring-tensioning device telescopic caterpillar, 13 — suspension rear guide rollers, 14 — guide rollers 15, and the Shoe tracks, 16 — suspension front guide roller 17, the leading asterisk caterpillars, 18 — sprocket drive from the gear box, 19 — motoart frame, 20 — pull steering 21 — steering column 22 — column suspension skis, a 23 — spring skiing, 24 — skis. The engine, controls and other components are mounted to the frame of the hull is welded to the pipe brackets. Track top closed metal box that is bolted to lugs on the frame. He simultaneously imparts a longitudinal stiffness to the hull. It hosts the seat of the driver and passenger taken from a motorcycle. They are secured on the brackets and have cushioning. In the rear part of the casing on the lodgment is the gasoline tank, fixed steel tightening bands. On motonartah Irina Karelina, running a motorcycle engine “IZH-56” 13 HP To ensure a normal temperature he equipped with a homemade fan shroud that guides the air flow on the fins of the cylinder. The fan is powered by a special actuator, which in the shank of the crankshaft on which was mounted the generator on the cone pulley is located under the V-belt. A second driven pulley fixed on the axis of the impeller. Ignition system the engine is made from magneto. Drive magneto, his clutch connected to the engine via a pulley of the fan. Power transmission from motor to drive shaft track comprises a box of speeds, providing a change of traction, and having the switch on the back. Transmission from the motor to the box speed and from it the shaft of the caterpillar chain. 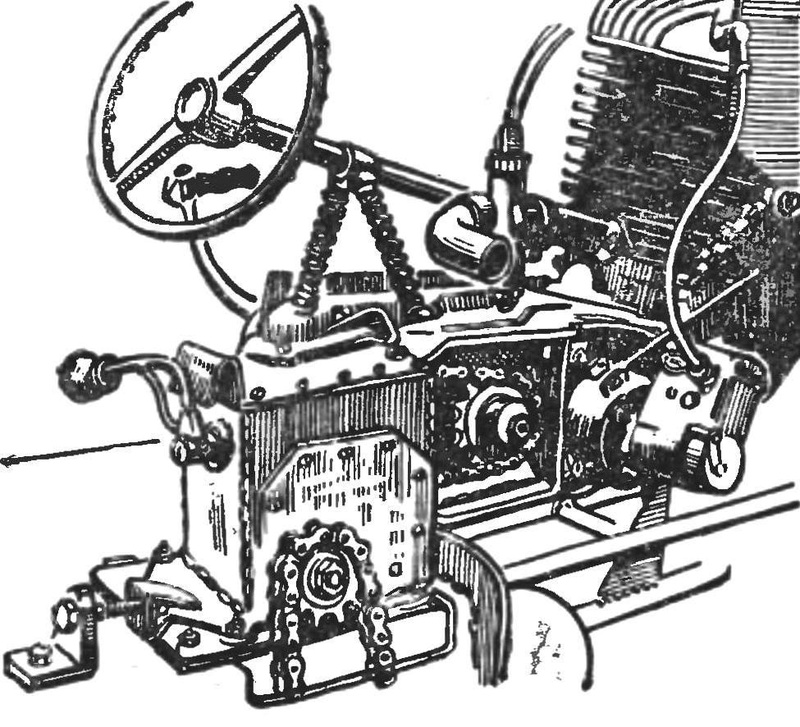 The machine is controlled two front skis; a steering column of automobile type. To increase the reliability of the drive control on the ski made according to the parallelogram scheme, with two transverse rods. With traditional means of transportation taiga hunter — skis, lined with fur, today motonarty compete with metal caterpillar. They built a reader of our magazine A. I. Karelin from the village Peleduy, Yakut ASSR. In his quest to adapt a conventional motorcycle for movement on snow V. I. Shadrin are not alone. For the last time, the lovers made a different design that increases the permeability of the motorcycle. Working in this direction A. Svetashov of the Kuibyshev region, P. Kaplanov of Krasnoyarsk region and others. But, unfortunately, not yet found such a variant which with minimal alteration. the least amount of new parts would provide the desired maneuverability of the motorcycle on winter roads. But this design is very necessary. Many thousands of bikes in the snowy areas of the country are used, usually only in the summer, that is only 2-3 months out of the year. Therefore we expect from our readers of new developments, the best of which will be published in the magazine. AS FOR THE VILLAGE WITHOUT A TRACTOR?